Differentiation is the name of the game in today’s retail marketplace. Amazon.com’s direct business model has become a market disruptor, forcing retailers to re-evaluate their in-store and online sales strategies. At the same time, their traditional competitors are also discovering that they must transform their business processes in big ways, and working to grow revenue while living on razor-thin profits. IBM’s approach to working with retail customers is taking some new turns, as shown at the National Retail Federation NRF2018 conference in New York City (Jan. 16-Jan. 17, 2018). The strategy is to combine multiple technologies, such as artificial intelligence (AI), machine learning (ML), and cloud services as instruments that will help retailers compete more effectively in 2018. Hyperlocal data for differentiated stores. Systems that support a Hyperlocal focus for identifying new store locations and selecting the correct inventory mix of products for each location. Specific information about each potential store location supports business decisions about finding new store locations within a city or county. The hyperlocal approach depends on artificial intelligence (IBM Watson and AI) and detailed data sources regarding local products, local sales trends, and local competitors, along with transportation options, and local weather conditions. Changing communication styles. Interactive communications with online customers, and “chats” powered by artificial intelligence (AI) are emerging as retailers work to forge relationships with 30-something Millenials and GenZ teens. Younger shoppers demand more online interaction, and deep product knowledge, provided in a “texting” context. This communications style taps product and inventory data, presenting it as an interactive online conversation. Re-engineering the supply-chain. Applying Blockchain hyperledger technology to bring transparency to multi-partner supply chains, IBM is forming a joint venture with Maersk, the Danish logistics and transportation company. As part of the venture, the two companies are working with an ecosystem of supply-chain partners. This new collaboration, announced in November, is designed to bring IBM retail customers better insights to logistics and distribution, and faster time to market. 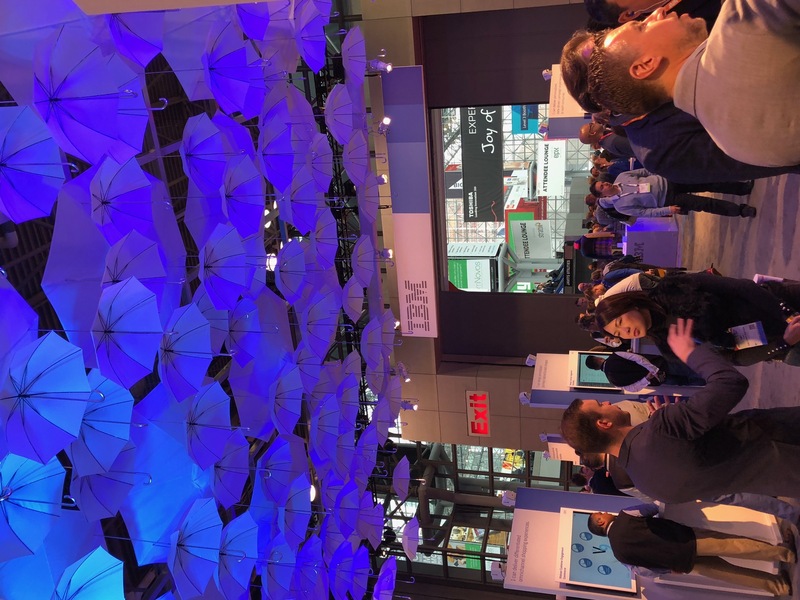 IBM is telling a solutions story for its retail offerings, aimed at the business managers and business executives who are trying to preserve and grow market share in the highly competitive, thin-margin retail marketplace. To do this, IBM is moving away from a purely technical view of its portfolio – and emphasizing its longtime role as a business partner, combining technologies into business solutions. This focus on the retail industry is timely as a growth segment for IBM, because retail companies find they must innovate – or lose business in an a highly competitive industry with traditionally thin margins. There is an industry-wide opportunity to transform retail businesses by using new technologies. But it is often difficult to apply all the pieces of technology to build new retail solutions – and to do so quickly. Amazon.com has been viewed as a disruptor across many industries, because it challenges traditional and conventional business practices, and offers online alternatives. In retail, all of the major retailers are competing in new ways – revamping their in-store and on-line systems to support new styles of engagement with supply-chain partners and the buying public of consumers. This drives the need for each retailer to differentiate retail offerings in terms of products, and in terms of sales style, to grow revenue and profits. 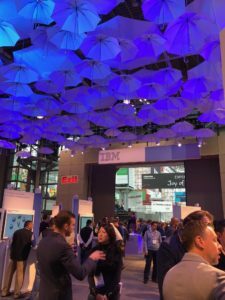 Significantly, IBM chose to show how each of its technology initiatives is being deployed throughout the entire retail value ecosystem for in-store and online merchandising. This includes product design, supply-chain, distribution logistics, inventory management, sales promotions, business-to-consumer (B to C) marketing, and building mobile-phone support for online sales. IBM is supporting the entire retail organization, across all of its activities, from the siting of brick-and-mortar stores, to their daily operations, their relationships with suppliers – and their rapidly growing online presence for direct marketing to consumers. Looking ahead is critical to understanding how the retail industry is being transformed. New shopping styles are emerging that are changing the shape of competition now – and into the future. IBM’s research in the retail space supports its view that retailers must market to multiple “generations” of shoppers simultaneously. This is no easy task, as the generations have varying interests – and budgets. Boomers, Gen X and Gen Z customers see things very differently – and have different goals when they go shopping. To understand the dynamics of each generation, IBM and the NRF co-funded a 15,000-person worldwide study of the emerging GenZ consumers, most of whom are still teenagers. The findings? It is the “mix” of baby-boomer, Gen X, Millennial and Gen Z consumers that retailers must get right, as retailers create and launch their strategic campaigns to be competitive across each of those generational groups.